Family Photo! We don't get enough of these. Yesterday we had Isabel's child dedication at our church. 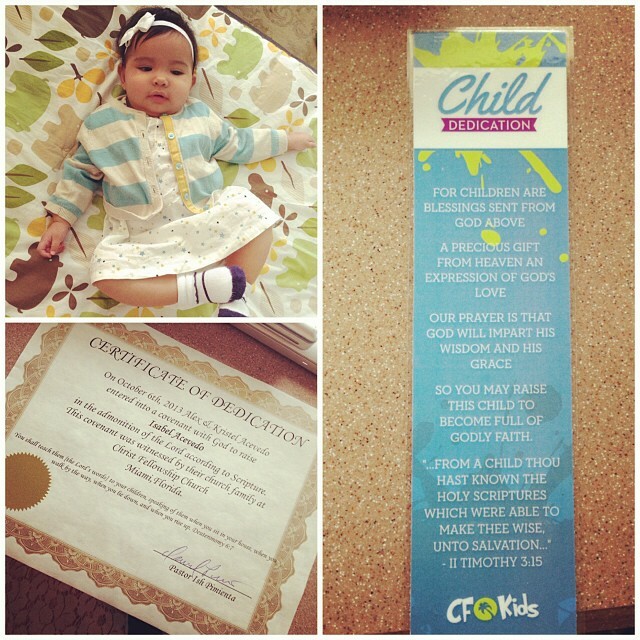 I love child dedications. Having a kid is overwhelming sometimes. There's so much responsibility that we take on as parents...and as Christian parents we take on the additional responsibility of raising our children in the faith. But we have our church to come alongside us and help us in that regard. When we do child dedications at our church we are promising as parents to teach our children about God...but our church family is also promising to help us. It takes a village to raise a child, of that I am a firm believer. I'm thankful for the village we have at Christ Fellowship. We love you so much and are so thankful for your life. You make everyone smile and feel joy with your sweet disposition. We pray that God would bless you and each and every single day of your beautiful life and we pray that you would come to know Him and love Him. We pray that you would be a fearless follower of God and that He would use you in a great way. Blessings to you, my darling girl. We love you.